The Sailor's Revenge, or the Strand in Uproar, Louis Philipe Boitard, printed by Robert Sayer, 1749, British Museum. We return to the rioting that destroyed a bawdy house on the Strand. Lasting from July 1st through July 3rd, the London neighborhood was the site of continuous violent upheaval. It all began when a sailor was robbed by a prostitute. His injury was only increased by the pimp, who beat the poor sailor. The beaten jack returned with scores of his shipmates that night. Boitard depicts "The Sailor's Revenge" on that establishment in this print. 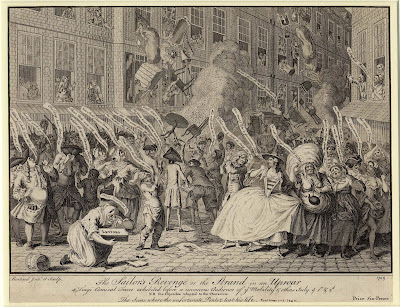 The Strand Riot of 1749 is largely remembered for the wig maker who was executed for his role. Bosavaren Penlez was caught looting the tavern of Peter Wood on the third night of the riots and became a scapegoat. No less a figure than Henry Fielding defended the court's sentence, though many were appalled by it. Politics played a significant role in the city's response to the riot, and the failure to indict any sailors may be a reflection of that. 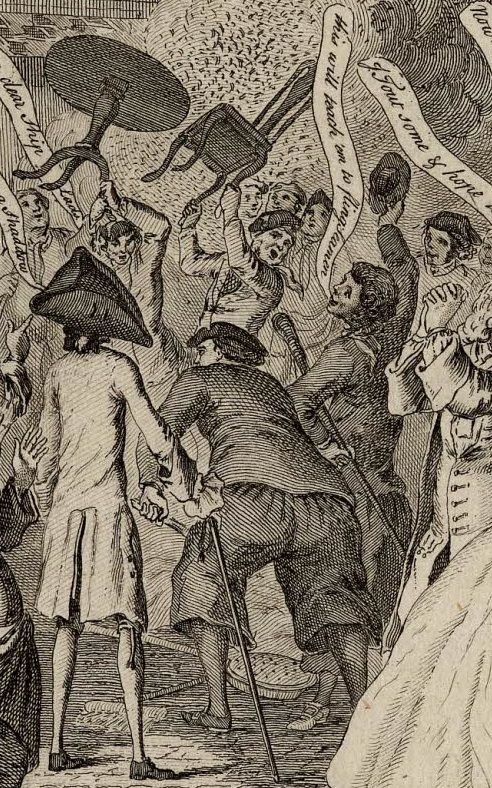 You can read more about the Strand Riot at Unruly Eighteenth Century. For the most thorough treatment of this and other instances of crime and violence following the War of Austrian Succession, pick up a copy of Nicholas Rogers' Mayhem, published by the Lewis Walpole Library. Boitard depicts a diverse crowd: an old woman inspects some of the loot in the foreground, and behind her a boy makes off with a bucket full of booty. The majority of rioters, however, are clearly sailors. At the center of the piece, leaning toward the bonfire, is a sailor clutching a cudgel. His short jacket is without vents, and his plain slops/petticoat trousers end slightly below the knee. Atop his head is a cocked hat with the point forward. In his left hand is a cudgel. Just to his right is another tar, waving a round hat and with a long walking stick beneath his left arm. He wears a neckcloth tied to his left, a short jacket and long slops/petticoat trousers. To the immediate left and behind of him is a jack wielding a Queen Anne style chair. A plain neckcloth flies up as he lifts his arms, which gives us a fairly good view of his single breasted jacket, which is without cuffs. His cocked hat is turned backward, and nearly falling off his head. 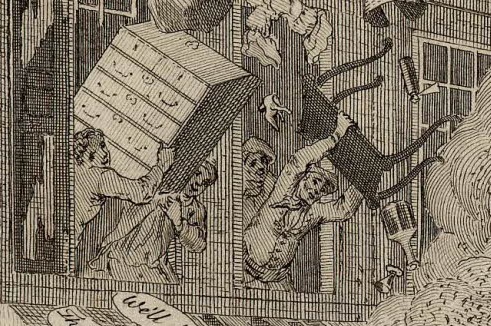 In the lower window, a few sailors toss furniture onto the street. The fellow on the right is defenestrating a short Queen Anne style table. He wears a round hat with a very short brim, or perhaps a knit cap. His jacket is single breasted and, interestingly, appears to be tucked into his slops or trousers. In the window to his left, a pair of his mates heave a slant front desk onto the street. The only one we get a good look at is the fellow on the right. He also wear a knit cap or round hat. His single breasted jacket is open, revealing his shirt without waistcoat, and the band of his trousers or slops.